Do you know what is BROCCOLIN® ? BROCCOLIN® is an extract of broccoli, obtained by the unique method which preserves all its ingredients in their natural form found in the fresh vegetable. This is achieved by processing the freshly picked broccoli and submitting it to the extraction process which flows faster than withering. This process preserves all vitamins and minerals that lose their quality quickly as the broccoli ages. During picking process age of the broccoli is taken into consideration so that the extraction can be done in the exact time when the broccoli has reached the highest concentration of Indol-3-carbinol and Sulforafan, two compounds that are found in the chlorophyll of the broccoli which are proven to increase the resistivity of the human organism to the development of the cancerogenic diseases. Investigations carried out by Faculty of chemical engineering and Faculty of agriculture in Zagreb have confirmed the apropriateness of our procedure - it preserves all vitamins, minerals and other ingredients of nutritional value in the extract obtained in the process, and test on the Faculty of medicine in Zagreb have confirmed the high immunological effect. Why do we recommend BROCCOLIN® ? Because of the rich content of vitamins and minerals BROCCOLIN® is excellent vegetarian complement in every day diet. Because of completeness of its nutritional content, low calory value and high content of non digestable fibres that stimulate correct and timely transfer of food through the digestive system, BROCCOLIN® is recommended as an almost irreplaceable component of a succesfull and harmless reductive diet. 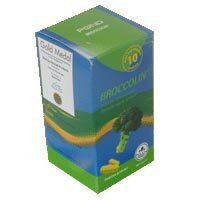 BROCCOLIN® is recommended as an every day preventive in strengthening the defensice capabilities of human organism. How to take BROCCOLIN® ? 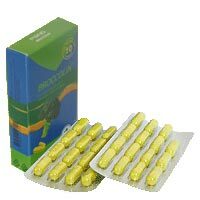 BROCCOLIN® broccoli extract is prepared in capsules and it ensures consumation in every place and in any time, as a vegetarian component of your daily diet. For normal daily needs as a food supplement and imnuty stimulator 1 to 3 capsules a day should suffice. At risk groups dosage can be enlarged without any risk. BROCCOLIN® is an authentic croatian product, made out of organically grown broccoli on croatian farms, far from traffic and other polluters. BROCCOLIN® is a pure broccoli extraxt and does not contain any other additives.